You may have heard that Tempur-Pedic’s award winning pillows and mattresses were formulated and designed by NASA. This may send some little alerts in your head that very talented scientists were the minds behind its construction which must mean the pillows are fabulous, right? Well, while the great minds behind it did create an awesome product, whether it was designed for astronauts or not, its technology is now available to us and we see many products trying to copy the same concept. The foam is memory, but it is extremely high quality and reacts to the pressure of your body against the surface. To give you a better idea of why this memory foam is so special, keep in mind that it was designed not to handle just typical weight from the head or body but that it was designed to handle G-force in space. This means the pillows here are ready to handle, conform to and respond to your body giving you a sleep experience designed specifically for you. Made by Tempur-Pedic: Each and every pillow selected for this list has been designed and made by the Tempur-Pedic company, holding up to the high standards the company has set. While other companies may provide quality products, there is simply not a good enough comparison for Tempur-Pedic quality memory foam. Manufactured in America: All of Tempur-Pedic’s products are made and assembled in America, holding to American rules and regulations. You know that when you buy these pillows you are getting a quality product that is safe and pays decent wages to all workers. Durable: Tempur-Pedic pillows do allow for some give and may take some time to get adjusted to, to fluff up or flatten a bit or soften, but they do not wear out. The pillows included in this list were chosen because they are durable and long lasting. Machine washable cover: Some of the pillows on this list are made especially to be cooling and to keep hot sleepers from overheating and sweating excessively. However, some sweat and dirt is impossible to avoid and so the pillows thankfully has a cover that is easy to remove and wash.
High quality memory foam: You probably have stumbled upon Tempur-Pedic because you have heard raving reviews that the memory foam is high quality. This is true and provides you with accurate support and comfort throughout the night. This Tempur-Pedic model comes in two different editions of which both of them are high quality and are only a year apart, either the 2017 or the 2018. You can also order this pillow in either the small, medium or large size or even in the travel size pillow if you need to take this one on the go with you. 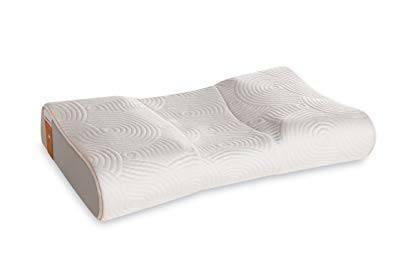 While the pillow is a bit pricey, you are not only getting a memory foam pillow but it is ergonomically designed to contour especially with the natural curve of your neck and head. The cover of this pillow is made from high quality cotton and the cover is easy to remove and to clean either in the washing machine or with a wet cloth. Tempur-Pedic’s ergo-neck pillow is overall comfortable, and durable and will able able to hold up to your regular, nightly uses. 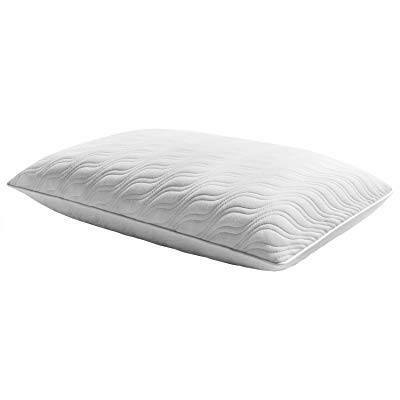 The form of this Tempur-Pedic pillow is not made to be flat with a rolled in for added neck support, but it more like any standard pillow shape, just layered with Tempur technology, though it does include one flatter side and one slightly arched side for comfort. 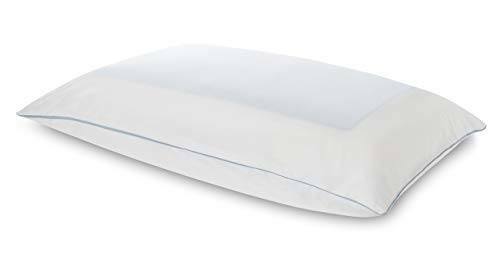 The pillow is extremely light and covered with a breathable, washable, white pillow cover that is easy to remove. The pillow is rather firm and takes some time to adjust to, it will soften out with time and continued use but that does not mean it flattens easily or loses quality. As with all Tempur-Pedic products this pillow was made in the USA under our careful laws and restrictions. When you go to purchase this product check to see if you are purchasing a new or used model, while they are both very good and dependable that is just up to your personal preference and you should be sure of what you are getting. You can order either and queen or king sized pillow and choose the 2017 model or the 2018 year model. 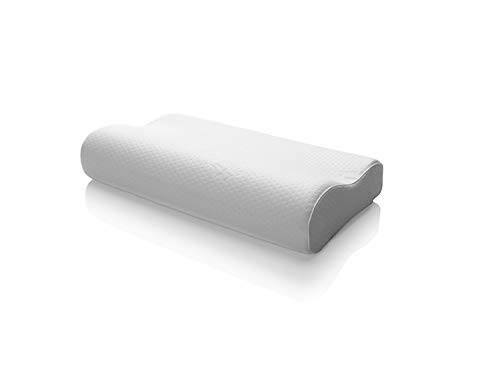 This pillow is called the cloud breeze model because it is not just a memory foam pillow but one that is cooling with a gel layer on each side of the pillow. On the off chance, however, that you do get the pillow sweaty or otherwise dirty, you can very easily remove the cover and put it in the washing machine without worrying about potential damage that can be done. With the Tempur-Adapt pillows you can order one in either the proLo, proHi, or proMid which determines the height of the pillows. If you are a stomach or side sleeper you may prefer the proLo or proMid pillow that is not very high, while back sleepers may choose a proHi or proMid pillow for added neck support. You can order a queen or king size pillow depending on which is best for your bed and sleeping style. As with all pillows it is made in America with high quality foam and the cover can be taken off and washed in the washing machine. If you are a combination sleeper this may be the perfect pillow for you as it is designed with two zones and a dented in well for your head. You can order either the 2017 or 2018 edition, the latter being the cheaper option but does not come with lower quality. This pillow like the others will adapt with you once you give it time for your body to adjust to the pillow and the pillow to soften a bit. You have a 5 year guarantee on the pillow and can easily wash the cover whenever you feel it is getting a bit too dirty, sweaty or stinky. Tempur-Pedic is a company that has been designing and dreaming up new ideas for better sleep for a very long time. The company may have began with the idea of perfecting space sleep, but now is a dream for those of us down on Earth. Each of the products created and distributed by this company are high quality and ensured to ease your rest and help you to sleep better and stay asleep. You can choose from a variety of pillows including cooling, ergonomic, neck support and flatter pillows for stomach sleepers. Whatever your individual needs are, you can find a comfortable pillow that provides you with proper support and comfort, if you are able to pay for them as they do come at a slightly steep price. The price is worth it if you are trying to get a truly good night’s sleep, then it is worth making a small investment into your sleep and health. bedroomcritic.com is a participant in the Amazon Services LLC Associates Program, an affiliate advertising program designed to provide a means for sites to earn advertising fees by advertising and linking to Amazon.com.